As a determined vacationer you will most likely have chosen the 3 Peaks Resort and Beach Club for its ideal location, rustic décor, modern amenities, and superb service. Yet, having spent a day or several on the lake or the mountains, exploring local boutique shops and galleries, or enjoying a fish dinner by the lake, the restless guest with a few extra coins in his or her pocket may want to consider an excursion out of state. Step across the line to the bright lights of Stateline, Nevada, and into the fantasyland of big time casino action. MontBleu, formerly Caesars, Harrah's, Harvey's, and Horizon are the four largest gambling establishments here, featuring every sort of wagering. Slot and video poker machines are too numerous to count as are the table games, craps, and roulette. That ever popular buffet dining experience is here as well. MontBleu's casino has slots and video, table games, and The Zone where poker players can find virtually every popular game while keeping up-to-date on world racing and sporting events via huge plasma screens on the walls. Prefer to do one thing at a time? Enjoy a deli sandwich while watching one of the 12, individual 12-inch TV's. MontBleu's fine dining features steak, seafood, and vegetarian dishes complemented by over 300 wines and champagnes. The Unbuffet goes a step beyond the typical buffet offerings. Catch a show at Horizon's Golden Cabaret or a movie in their Horizon Stadium Cinemas multiplex movie theater. The casino is cozy and friendly while maintaining all the excitement of the larger venues. Harrah's alone has eight restaurants offering everything from light sandwiches to the finest haute cuisine. The Summit is billed as one of America's top ten restaurants; it has a magnificent view from it's location on the 16th floor; and, a pianist soothes diners' digestion in the evenings. 900 slots, table games, Keno, baccarat, and poker keep gamblers alert. Harvey's Cabo Wabo Cantina offers live music and some unique cocktails of an evening. The art of Remington and Russell hang on the walls of the Sage Room Steak House, but it's rock and roll wall hangings at The Hard Rock Café. The casino covers 52,000 sq. ft. with the latest and best in gaming action. Stateline's in Nevada, and that means you can get married any time you like. Get married in one of the casino wedding chapels or outdoors with the lake and Sierras in the background. If you prefer to plan ahead a bit, hire professional wedding planners to arrange everything for you and your guests. Golf. 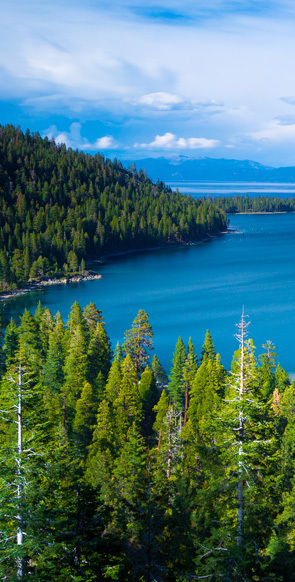 Yes, Stateline has one of the better, and pricier, courses on the southern shore of Lake Tahoe. Edgewood is a public course with tree-lined fairways, water hazards, and many sand and grass bunkers. Genoa Lakes Golf Club & Resort, just 5 miles from Stateline, has an18-hole public course, and its Resort #2, another two miles up the road, also features an 18-hole public course. Zephyr Cove Stables is a great place to catch a ride on horseback with a cowboy guide and a hot meal. Located just four miles from the heated action of the casinos, the more leisurely pace of national forest land trails and scenic vistas is a great way to get back to nature.